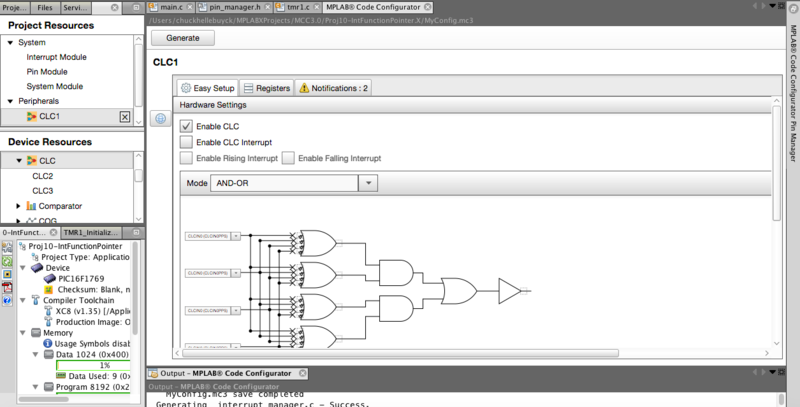 The MPLAB® Code Configurator (MCC) incorporates the Configurable Logic Cell (CLC) GUI tool. When a device with the CLC peripheral is used and the CLC peripheral is selected within the MCC, the CLC tool will appear and the code for the device can be generated. Refer to the article on the CLC GUI tool for more detail on how to use it. The MCC CLC tool can only generate C code whereas the standalone CLC GUI tool can generate both C code and MPASM assembly code for the device.